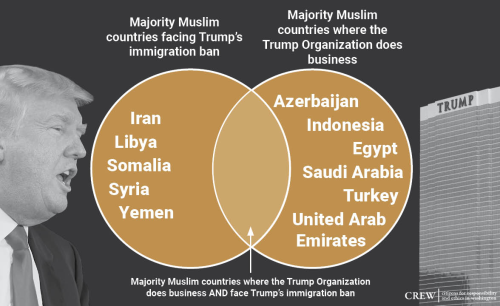 In an astounding coincidence, none of the Muslim-majority countries where the Trump Organization does business has faced Trump’s immigration ban. All the people who should be concerned by this aren’t. I’m referring to his supporters of course. Big surprise! How have you been Scottie? How’s life down in Florida? I’m doing well. We hope to move sometime in the next five years. We went to Panama, Ecuador and Colombia in January for two weeks. It was fabulous. We spent a week driving all over Panama, it seems like it would be a great place to retire. If tRump gets reelected, we may leave sooner. I’m glad you are doing well. How did your house renovations go? Please send my best to Ron. It’s odd also that the ban is because of terrorist links and yet the county that provided most of the terrorists for 9/11, the country that sponsors most of the terrorists in the Middle East and the country that can, with the Royal seal of approval kidnap and butcher a resident of the US, is Saudi Arabia. Isn’t it strange that Saudi aren’t banned?I wonder why. The other reason would be money too, The Government won’t want to lose the arms contracts they have from Saudi.which no doubt will include planes, missiles and guidance systems. Ah yes, there’s that, too. There is a nuclear deal afoot, from what I understand, that Congress would like to cancel, but Trump & cohorts would push forward, for it is more money in the pockets of the arms manufacturers. Wonder how he’ll feel when those nukes are aimed right back here? David-You said exactly what I was going to say, albeit you explained things more eloquently than I would’ve. It’s actually quite mind-boggling that his supporters are so totally blind to these things. While we know the Evangelicals could care less, surely there are those who have something working “upstairs” that can see through his actions. Surely?